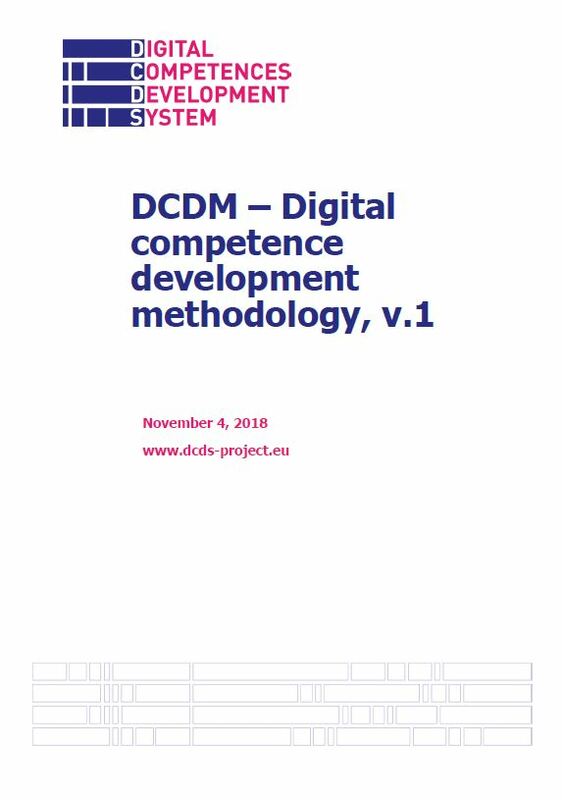 This is the first version of the Digital competence development methodology (DCDM) of the Digital Competences Development System (DCDS) project. The methodology and the choices based on it for the design and delivery of digital competence training to adult learners, following a blended learning approach, will be tested in pilot training activities in five DCDS partner countries (Greece, Italy, Latvia, Romania, and Spain). Based on the feedback and results of the training pilots, the DCDM will be revised and updated as deliverable D9, due in October 2019. This document presents the following components of the methodology. Chapter 1 illustrates the steps and results of the implementation process of the European Digital competence framework for all citizens (DigComp) for the purposes of the DCDS project. DCDS focuses exclusively on proficiency levels 1 and 2 (foundation level) across all 21 DigComp competences. The corresponding competence descriptors were specified into 95 learning outcomes (LOUTs) drawn from or inspired by various sources (Annex 1 lists the 95 LOUTs and Annex 5 all the sources used). These include the Digital Economy and Society Index produced by Eurostat, which measures amongst other aspects the level of digital skills in the whole European population. Chapter 2 illustrates the principles of formal and non-formal adult education adopted in DCDS and the attention that will be paid to social learning aspects. The second part of the chapter clarifies how blended learning will occur in DCDS, by describing the facilitation, tutoring and teaching functions that will be performed and the Teacher Guide to support them, and by briefly presenting the technical tools that will be used. The blended learning will combine face-to-face training in the premises of the DCDS partners’ digital competence centres with online learning via the Digital competence development environment (DCDE), based on a Moodle platform. Chapter 3 is devoted to the training offer and instructional elements of DCDS. It first illustrates how participants will be profiled and asked to take a self-assessment test in order to customize their learning experience. Then the chapter presents the training offer structured into 4 learning paths (LPs), made of a total 64 learning units (LUs) organized into 19 thematic modules, which are designed to achieve all the 95 identified learning outcomes covering the 21 DigComp competence. In the DCDS pilots, individual participants will be able to take the base LP plus only one of the three complementary LPs, due to the project’s time limitations (course duration in the pilots will be 60 hours: 40 hours of face-to-face training and 20 hours of online activity). Chapter 4 presents the main notions and options of the game-like application the will be integrated into the DCDE primarily in order to enhance the participants’ motivation to engage in the course. Finally, Chapter 5 presents the evaluation system in DCDS which addresses learning assessment (both formative and summative), competence validation with the issuing of badges and course quality evaluation.